A Miami family of four says their story of service started small – quite literally – when siblings Thalia and Chaz Castro, then six and four-years-old respectively, helped their school classmate with his endeavor to give back to their community. The sister and brother duo attended montessori school with Joshua Williams, who at four and a half, decided he wanted to fight global hunger and poverty, launching Joshua’s Heart Foundation (JHF) in 2005. 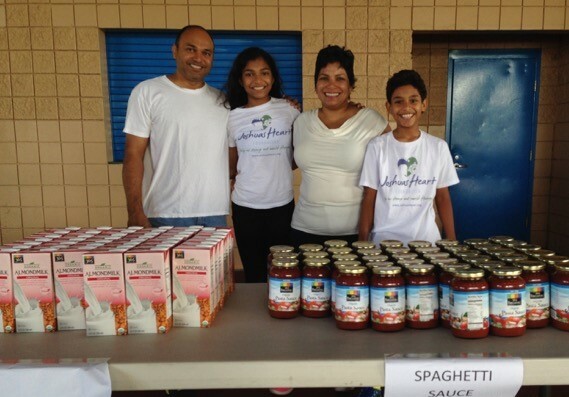 In South Florida, where fifteen percent of the residents experience food insecurity, JHF is a direct line to those in need, helping to organize food distribution events and sourcing grocery items and non-perishable goods. Out of necessity, parents Angel and Fara Castro supported their young children in their service, driving and supervising them at events. Fast forward to today, those small children are now grown and thriving teenagers, and what started as an effort to instill compassion in their children through community service has now become a family’s mission to help those in need. Sharing blessings they are thankful for with their greater community, the Castro family is generous with their time and efforts, and is today’s Daily Point of Light award honoree. Points of Light spoke to the Castro family to learn more about their work with JHF. What inspires you to volunteer as a family? Angel: It’s a sense of us being able to do something together, and work towards a common goal to achieve something. To be able to help others in need at the same time gave us an opportunity to really unite as a family and impact the lives of others. How has volunteering impacted your family? Fara: As a parent, we’ve very fortunate, our family is fortunate. A lot of times in society, kids don’t seem to realize how fortunate they are. Volunteering was a way of getting our kids involved. Because of their service, our children are empathetic, they’ve been giving food and blankets to the homeless. They are aware of people in the community that need help. Angel: When we started to get involved in volunteering with the kids, we were there as their parents, to transport them basically. Over the years, they’ve really blossomed and accepted the challenges involved in giving back. They now can go to events, organize them, conduct distributions because of all the years of experience they’ve gained. Describe your volunteer role with Joshua’s Heart Foundation. Thalia: My brother and I are on the junior advisory board for JHF, Chaz is the head of the welcoming committee, and I serve as the advisory board chair. JHF is a non-profit organization, so we meet once a month to fundraise, plan and scout for sponsors. We reach out to grocery stores and small businesses around the community soliciting perishable and non-perishable items for our distribution events and to stock our year-round food pantry. We’ve partnered with sponsors including First Care Home Services, Whole Foods, Publix, Feed the Children, T.J. Maxx, Unilever and SHSM. At the food distribution events, we engage one-on-one with the people we are providing groceries to. They share their stories as we pack their boxes with groceries, and we’re able to really connect with the individuals in a personal way. You help hungry kids in creative ways. Explain. Thalia: We have a Backpack Distribution program that forges a direct connection with hungry children. We send kids who qualify for free or reduced price school lunches home for the weekend and school holidays with backpacks full of nutritious, non-perishable food so that they can focus on their school work instead of hunger. Describe a meaningful experience you’ve had volunteering with the community. Chaz: Volunteering at the annual Thanksgiving distribution, where I got to know a family that had no money. All they had was each other. It meant a lot to me to meet them, because even though they had no food, they were really happy. They were talking to us about the meaning of Thanksgiving, and how you can help one another by being a part of the family. You’re making a difference at a young age. What does that mean to you? Chaz: It means a lot to me. Most kids my age aren’t doing a lot to help out. They notice people are in need, but they don’t really do anything. I’m thankful to be able to contribute and help out others, not just by saying it, but actually doing it, and by allowing a family to have food on the table like my family provides for me. How has volunteering strengthened your family, and multiplied the impact you’re making on the community? Thalia: Growing up, I know I was very fortunate to have had parents that were always able to provide for me. I realized through volunteering that there were a lot of kids living in low-income households, or kids that didn’t have basic necessities. But even though they faced these adversities, they remain united as families. They show up to the food distributions optimistic, and they’re happy to be receiving food. If I was in that situation, it would be very easy to have a negative outlook on the world – but that isn’t the case with these families. Helping as many families in our community as possible makes our family happy, and we have formed a stronger bond as a result of helping so many others. Fara: We’ve tried to teach our children how fortunate they are. There will always be people who have more or less than you, but it’s not about who has more or who has less, it’s about what you can do to add value, and what you can do to give back. You hope that by instilling that understanding in them, they become successful themselves, and they will always want to contribute to the community. What future events do you have coming up that you’re excited about? This Saturday, November 17, 2018 is the JHF annual Thanksgiving distribution. It is held at the North Miami Avenue Church of God, and we help to provide groceries for up to 300 families. Check the JHF website for more information on how you can help: https://joshuasheart.org/make-a-donation/. What will you have on your Thanksgiving table this year? Thalia: Turkey! We’ll have a lot of mashed potatoes because I love mashed potatoes. Fara: Always have chocolate. And a bottle of wine! What’s one thing you want readers to learn about your family’s service? Fara: Don’t underestimate the power of youth, the children. You’ve never too young to make a difference. Working together as a family, it strengthens you as a family. The feeling you get from volunteering is invaluable: the happiness, the contentment, the pride you feel when you see your children giving back. Do you want to make a difference in your community like the Castro Family? Visit All For Good for local volunteer opportunities.